Many of us are overwhelmed with email, Facebook updates, and the millions of shoes we could be browsing on Zappos, or books to buy on Amazon. On the web, every piece of content leads to two more pieces of content, and so on. But a book is a single story. A record a single piece of music. It focuses our attention, allowing us to experience a single thing. When you grow up with something, you often have a sentimental attachment to it. Even if you have no desire to own a rotary dial phone, you will still enjoy the memory of dialing a friend’s number on it when you were 13. Likewise, even a generation that didn’t grow up with something, can appreciate its retro appeal. There are tons of teenagers who are embracing vinyl records, even though they grew up in the age of MP3’s. Yes, sometimes I look at my iPhone or my iPad and think: “I am Captain Kirk, this is the future!” A newspaper is less challenging. It is not a magic black box, it is just paper. There is something about it that says it should be appreciated leisurely over a cup of coffee. In an age where social media makes every experience a shared experience, I can understand why some reject this in order to have a personal connection – a personal experience – with something, be it a book, a piece of music, or a magazine. The pressure to share, to influence or be influenced, can be too much sometimes. These are powerful psychological reasons, and I am considering how they do or don’t evolve with digital media. EG: will our kids have this same attachment to a book – that personal connection? Will they too become sentimental about discovering a CD in the corner of some music shop in a distant city, and the anticipation of bringing it home – always keeping it as a treasured personal experience? Will they get sentimental about the first generation iPod, about viewing a web page that looks like it was created in 1998, and will MySpace become a retro trend in 5 years time? I can’t bring myself to throw out mix tapes from high school. In reality, these are cheap, low quality cassette tapes that have already degraded over time. They are filled with 2nd generation copies of music off of other tapes. In fact – I haven’t owned a cassette player for years, so the likelihood of me every listening to them again is unlikely. Objectively, there is little personal experience here. Some tapes I made myself, others were made for me by friends. But like the web today – curation IS a form of self expression. Ownership of the original media was not the goal, the experience of lower-quality versions of songs from a friend was wildly more important. A record company executive in the 1980’s would have hated this. They would have preached about the value of owning the official release of a piece of music – the higher sound quality, the collectability, the connection a fan needs with the artist. Mix tapes were the opposite, they were unofficial, low quality and about the connection between fans. That same record company executive would have feared for the future of their industry because fans were copying and trading music freely. They would have lobbied Sony to keep a ‘record’ button off the Walkman, they would have pressured Maxell to keep the prices of blank cassettes at higher levels. You see this happening today with digital rights management systems on eBooks, on music companies suing fans for file sharing. I’m not going to pretend that both of these issues aren’t very important – they are. But when you see them as a risk, you miss the opportunity. The opportunity of fans sat up in their bedrooms in the 80’s, making mix tapes. How they extended what the music was, and made it personal. That is why social media is critically important for the future of all media. Because fans have become empowered not just to consume, but to extend and create. 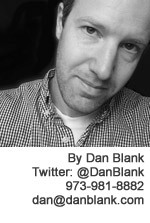 Let me know if I can help you extend the value of your media: @DanBlank, 973-981-8882 or dan@danblank.com.